We most definitely are not the sort of family who book holidays months in advance, usually it's a month or two at most - enough time for me to arrange some time off work. On this occasion though I got a text from Tom while I was at work saying "look what I've booked, you need to arrange some time off work." This was on the 13th July and we went away on the 2nd August. Thankfully no one else in my department has kids so they aren't mad enough to use up their annual leave in school holidays and my manager is one of the good ones so he approved my 10 days off with no bother. We had been debating about going on holiday for ages but didn't think we could afford it (hello new boiler!) but thankfully a few things changed and we realized we could afford a cheap and cheerful week away. A package holiday in the sun was out of the question as the likes of Spain and Portugal are ridiculously over priced in August so we started looking a little closer to home and decided on France. For long enough I refused France when Tom suggested it as the amount of war related attractions did not appeal but when you are planning a holiday for a family it ticked a lot of boxes - beach for Ethan, cute seaside towns for me and an abundance of historical sites to visit for Tom. It was significantly cheaper to get the ferry compared to flying and hiring a car but the ferry also meant a 5 hour car journey with a toddler. Call us crazy (or tight) but we decided to go for the car and ferry option. Thankfully there were plenty of sailing so we could pick one that worked well with Ethan’s routine. Outgoing we sailed at 9am from Newhaven to Dieppe which meant we drove through the night and the return sailing saw us arrive back in Newhaven at 9pm so once again we could drive while he slept. I was apprehensive about the car journey but Ethan was amazing. He slept for most of it and on the few occasions that he woke he was happy to watch CBeebies on the iPad. I would love to know Justin Fletcher's secret to success though - what is it about him that kids love so much?? Accommodation wise we decided self catering would be a better option for us and decided to take a chance on booking a little apartment on the outskirts of Caen through Air BnB. Usually we stay in hotels but we thought this would work better for us as a family and the outdoor space was very appealing. Slight error on our part though... we thought it was a one bedroom apartment but it was actually a studio. This did make bedtime difficult and we had to be super quiet once Ethan was asleep but it was still a great place to stay. The apartment had everything you could have needed; there was plenty of bedding, the kitchen was well stocked and everywhere was immaculate. It was actually attached to the owner's house but we had our own door and as they were away for most of the week it felt very private and was nice to have the gardens to ourselves. The first day was a write off as we spent so much of it travelling so Thursday was our first full day. I've realised going through the photos that we didn't take many photos on this day but there is quite a bit of footage on my vlog which I shall post below too. We started the day with a lazy morning then headed off to Arromanches for a spot of lunch and some time on the beach. Unfortunately it wasn't the warmest of days but it was dry and Ethan loved running around and digging in the sand.We did take him at the beach last year but he was only 5 months old so didn't really get it. This time he was running around like a loon while digging up sand and chucking it everywhere. Tom picked up a kite in Aldi a few weeks back and decided to try and fly it. I would like to say it was a success but in reality it was a bit of a disaster. The stunt kites were the same price as the normal ones so of course he picked the stunt one. We spent more time picking the kite up off the sand and detangling it than actually flying it. Nonetheless, it still gave us a few giggles. 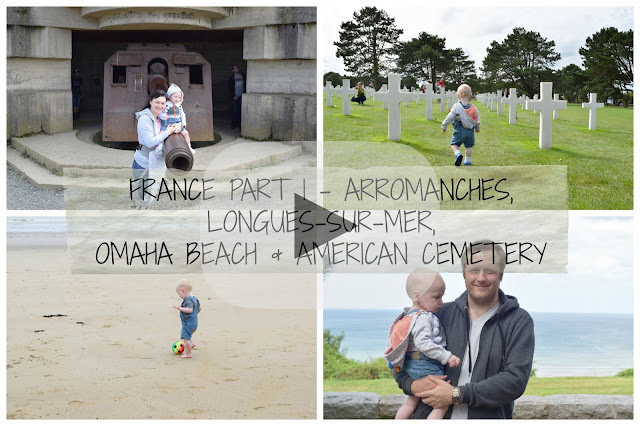 After a couple of hours we headed up to Omaha beach and to visit the American cemetery. It's a shame that we didn't spend time on the beach itself but the weather was a bit cooler and it was getting close to a certain little man's tea time. That was one thing we learned on this holiday - be flexible to an extent but don't veer too much from routine either. Now, I'm not in to war stuff, that's Tom's interest but it was still humbling to see all of those graves of so many young men that gave up their lives for our freedom. It was rows upon rows of crosses and I dread to think how many men were buried there. While we were at the cemetery the clock struck 5pm and we were able to watch as the flags were taken down from the flagpoles. I almost lifted the camera at that point to record it then decided against it. It was one of those times where it felt distasteful to start photographing or filming. Instead we stopped what we were doing and watched as each flag was brought down, folded up and put away. After an hour of walking round, admiring the sea views yet at the same time feeling saddened at the volume of victims of the War we headed back to our apartment.I'll be honest though, I had to detach myself from the sadness of it all. If I let myself truly dwell on it I would be an emotional mess and no use to anyone. The cemetery though was in a lovely location - looking out at the sea it was a constant reminder that there is a wonderful world out there, one that we need to explore and love, not to be torn apart by war. It was a great first day, a mix of beach time (for Ethan and I) and some history for Tom. I'll be back soon with Part 2 of our trip to Normandy.